Stylish and built to last, this Eurosmart Cosmopolitan kitchen tap is cleverly designed with a high swivel spout – perfect for washing big pans and you can adjust the operating radius of the tap so it doesn’t knock into any surrounding cupboards. As a single-lever tap it’s intuitive to operate and it has a cutting edge GROHE SilkMove ceramic cartridge so you can control water temperature and flow with smooth and effortless precision. With a quick wipe of a microfiber cloth it’s easy to clean the scratch resistant GROHE Starlight chrome coating, which has a sparkle that will last for years. 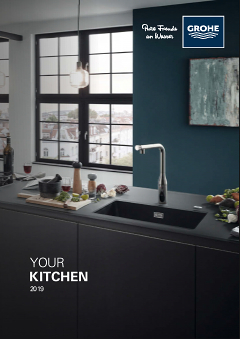 The Eurosmart Cosmopolitan kitchen tap – blending beautiful modern style and trusted quality.